From adaptogens to healing spices to superherbs, it isn't always easy to stay current with what's hot right now in the health world. It was only a year ago that I was introduced to ashwagandha and maca and even more recently that I finally learned how to pronounce them. Now I add them to my morning smoothies regularly and laud their effects to my friends. One of the latest superfood supplements to make a splash on the health scene is chlorella. A cousin of the better-known spirulina, chlorella is one under-the-radar superfood powerhouse you might want to consider studying up on and integrating into your diet. 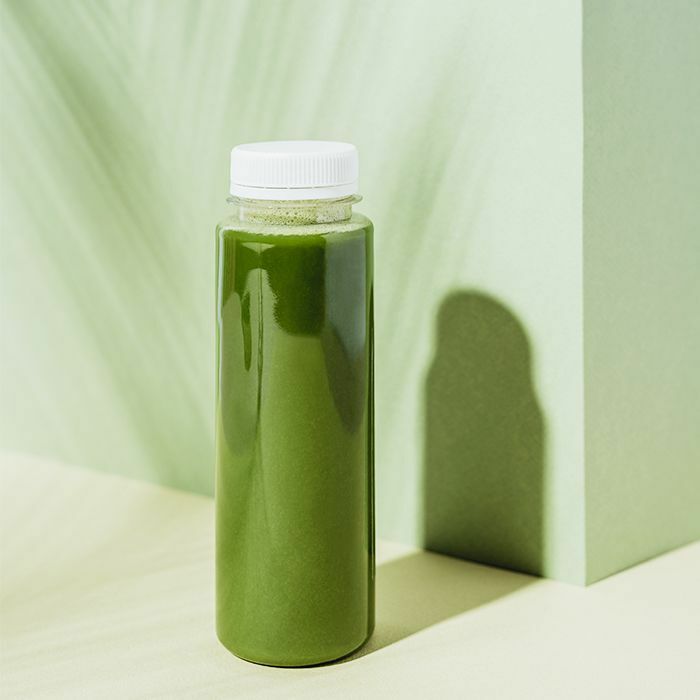 We reached out to wellness physician and health coach Josh Axe, DNM, DC, CNS, to give us the lowdown on the blue-green algae, from chlorella benefits to possible side effects. Native to Taiwan and Japan and now available stateside as a powder and pill, chlorella is an incredibly nutrient-dense superfood that boasts a number of health benefits outlined below. Chlorella helps to naturally detoxify your body of harmful substances. Axe explains that "the superfood wraps itself around toxins in our bodies like lead, cadmium, mercury, and uranium and stops them from being reabsorbed." If you integrate chlorella into your diet, "regular consumption can even keep heavy metals from accumulating in our bodies' soft tissues and organs in the first place," he says. Chlorella has risen in popularity because of its immunity-boosting properties. "Research published in 2012 in the Nutrition Journal studied healthy individuals and their immune system's response to chlorella supplements," recounts Axe. "The results showed that chlorella supports a healthy immune system response and helps 'natural killer' (NK) cell activity after just eight weeks of supplementation." "In a study published in the Journal of Medicinal Food, researchers state, 'Chlorella intake resulted in noticeable reductions in body fat percentage, serum total cholesterol, and fasting blood glucose levels,'" quotes Axe. "Chlorella benefits you by helping to regulate hormones, helping with metabolism, improving circulation, and promoting higher levels of energy. It can also help to reduce weight and body fat and removes stored toxins often released during weight loss." "Type 2 diabetes and high cholesterol are two of the serious chronic conditions facing many Americans today," says Axe. "Years of improper eating, stress, and a lack of sleep have led many to one or both of these diagnoses." Axe cites a study published in the Journal of Medicinal Food where researchers found that doses of 8000 milligrams of chlorella per day, divided into two doses, helps lower cholesterol and blood glucose levels. "Researchers observed first a decline in cholesterol levels, then the improvement in blood glucose," describes Axe. "They believe that chlorella activates a number of genes at the cellular level that improve insulin sensitivity, encouraging a healthy balance." Axe recommends two main ways of consuming chlorella. The first is adding a chlorella powder to a smoothie. "Chlorella has a very strong taste, so you will want to add about half a teaspoon of chlorella to a smoothie with banana, coconut water, vanilla protein powder, and lime juice to help hide the taste," he advises. The second method is taking chlorella tablets. "Simply take three to six tablets of chlorella with eight ounces of water one to three times daily to experience chlorella health benefits," Axe suggests. While chlorella boasts mostly positive health benefits, there are possible side effects, and it is possible to consume too much. "Some of the symptoms include swelling of the face or tongue, sensitivity to sunlight, digestive upset, acne, fatigue, lethargy, headaches, vertigo, and shaking," explains Axe. "The majority of these chlorella side effects and symptoms are typical to any detoxification program. However, individuals who are allergic to iodine and those who have been prescribed Coumadin or warfarin should consult with their physician prior to using chlorella." As with any major adjustments, it is best to consult with your physician or nutritionist to determine a healthy and safe amount of chlorella to integrate into your diet and begin with baby steps as your body gets used to it. "While many people aren't familiar with chlorella, there are a lot of people who have been taking spirulina for years," notes Axe. "They are both waterborne organisms, but at the cellular level, they are quite different." He explains that both have "a concentrated balance of nutrients shown to help cleanse and detoxify the body and a high concentration of protein that supports energy and clarity." In terms of protein levels and combinations of vitamins, minerals, phytonutrients, and phytochemicals, chlorella goes "one step beyond spirulina," says Axe, and "when used in tandem, their powers intensify."